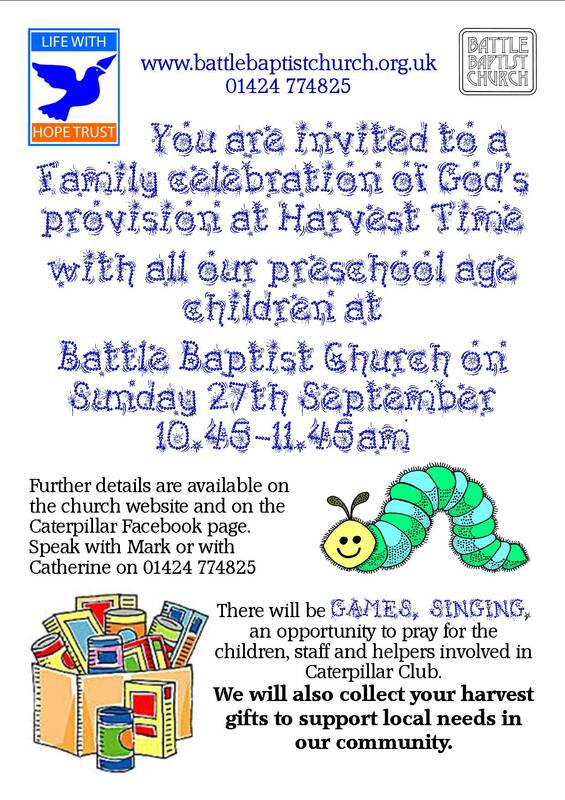 Caterpillar Pre-School of Battle Baptist Church (Ofsted Outstanding) have spaces available for children aged 2-years and above!We offer 15 hours FREE childcare for eligible 2-year-olds, 15 hours FREE childcare for ALL 3/4-year-olds, and 30 hours FREE childcare for eligible 3/4-year-olds!Please contact Jo on 01424 774997 or pop by for more information! You can also visit www.caterpillarpreschool.org.uk where you will find the eligibility criteria for all funding. Our “OUTSTANDING” Caterpillar Pre-School meets 5 days a week, with sessions running from 9am-12 noon and 12 noon -3pm. If you are thinking about a place for your two year old, then please phone us or drop in and arrange a “look round” to see if our warm and friendly staff and setting appeals to you! Click here to view the PreSchool website. In addition, during term time we run the ‘Caterpillar Crew After School Club’, which offers care for children up to the age of 8 years until 5.30pm. Children attending Battle & Langton Primary School are collected by Caterpillar staff and escorted over to the Club.